Did you know that approximately 90% of parking lots in the US are paved with asphalt pavement? Asphalt is used to pave a majority of US highways, streets, parking areas, walking & biking trails, and airports. Currently, there are approximately 3,500 asphalt production companies located in the United States. With over 4.1 million miles of public roadways in this nation, that is a lot of surface area to pave. You need a paving contractor if you have any land surfaces that must be paved, such as driveways or parking lots. 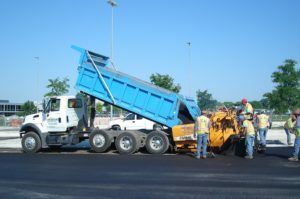 Consider the following ways paving contractor Delaware County can assist you in your next asphalt surfacing job. When searching for a paving contractor, it is important to find a company that is qualified and has years of experience so you can be assured the job will get done in the right manner. The most qualified company will have the right skillset, equipment, and excavation & planning team to provide you with a driveway that is durable and smooth—and long-lasting! Additionally, you may have need of an existing driveway to be resurfaced. Paved surfaces like driveways and parking lots go through a lot of wear and tear. They can become damaged by the following elements and receive cracks and potholes that mar the surface. Paving contractors can assist in restoring such a damaged driveway and provide you with a water-resistent tight surface that will be durable for years to come. Again, it is vital that you search for a paving contractor that is qualified and works with a team of experts. The company should exhibit professionalism in all aspects of contact with you from the initial estimation of services, to the fulfillment of their expertise on the job site. You want to ensure that your asphalt surfacing job gets done right. Not only should all work done by such contractors be accurate and durable—you also want the end result to be aesthetically pleasing to the eye. Additionally, the completion of work should be done in a timely manner, while never disturbing your own employees, customers, patrons, or guests. Not every paving contractor can handle these larger type jobs, so be very selective in your hiring of the right contractor. It is important to find a team of experts who can handle the large work order in a timely fashion, while staying on budget. Paving new surfaces, resurfacing existing ones, and repairing damaged areas are all important aspects of the paving contractor’s job. However, asphalt surface maintenance is arguably one of the most important jobs they have. If the asphalt surface is not properly maintained, it will not be durable and will easily damage under normal daily outdoor conditions. You need a paving contractor for professional asphalt surface maintenance. Are your current asphalt surfaces crack-free, smooth, and durable? Have the outside elements taken a toll on the smooth surface of your driveway or parking lot? Do you currently have a maintenance plan in place to ensure the durability of your surfaces? Are you prepared to correct any damage issues before they start to ruin your asphalt areas? Are you prepared to repair cracks, correct drainage issues, or prevent potholes? Specialized technicians will visit your site to analyze the area and provide you with a comprehensive report of any issues regarding drainage, grading, or asphalt damage. In the conclusion of the report, you should be advised of any recommendations regarding necessary repairs and how you can extend the life of your surface through maintenance. Having a top quality pavement job completed at your site is a very detailed process. However, it can be easily understood by considering the following three steps. Correct Paving Specifications – The most important starting point in this process is to ensure that the right specifications are determined for the job site. A qualified contractor will consider budgetary concerns as well as durability of the product, while adjusting the site specifications. Proper Grading – Secondly, the job will be done right when the proper grading at the site is completed. The asphalt will not remain smooth and durable if the core base layer is not correct. The stone base must be graded properly in order to guarantee correct drainage at the site. Residential projects require a 2” wearing top level and a 6” stone base. Light commercial jobs necessitate a 1½” wearing level, 2” binder, and 8” stone base. Farm property projects need to have a 2½” modified binder and 8” stone base. Industrial jobs require a 1½” wearing layer, 5” binder, and 10” stone base. Correct Application of Asphalt – The results will be maximized when the freshly applied asphalt is properly placed and then compressed while still warm. This is a time sensitive process, so it is essential to utilize the most qualified and professional paving contractor in your area. If you want to extend the durability of your paved surfaces, consider implementing the following effective asphalt maintenance tips once the paving project is completed. Paving contractors are an invaluable resource for anyone who needs to have asphalt surfacing projects completed in the residential, commercial, or industrial sector. Do you have any paving projects that need completion by such contractors?